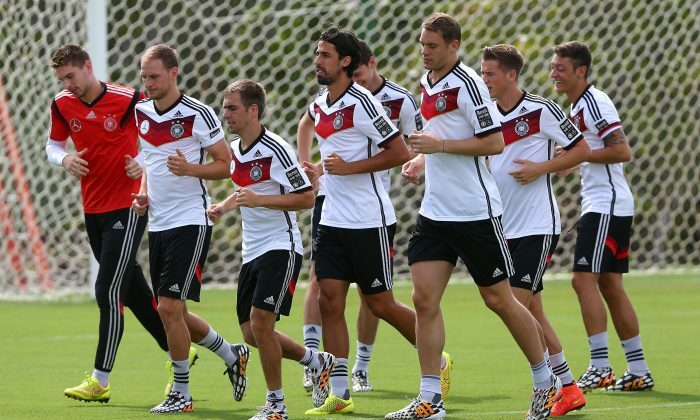 Brazil and Germany will go head-to-head in a World Cup 2014 match on Tuesday, July 8. Kick-off time is 4:00 p.m. EDT at Estádio Mineirão, Belo Horizonte. The game will be broadcast on Globo, Band, SporTV, FOX Sports 1 Brasil, BandSports, and ESPN Brasil in Brazil, as well as Zattoo, ZDF, and MDR Info in Germany. The game will also air on BBC One UK, TalkSport Radio, BBC Radio 5 Live, and BBC Red Button in the United Kingdom, as well as Univision USA, Futbol de Primera Radio, ESPN Deportes Radio, ESPN Radio, ESPN Deportes+, ESPN, Univision Deportes USA, SiriusXM FC, Univision Deportes En Vivo, and ESPN Deportes in the United States. Live stream is available on Watch ESPN Brasil, ZDF Sport Live Stream, BBC iPlayer, and Watch ESPN. See an AP preview below. BELO HORIZONTE, Brazil (AP) — Even without Neymar, Brazil’s show must go on. The World Cup hosts, now forced to play without their injured superstar, will face Germany on Tuesday for a spot in next weekend’s final. Neymar fractured a vertebra in his lower back in Brazil’s quarterfinal win over Colombia, ruling him out for the rest of the tournament. But despite having to stay off the field, the 22-year-old striker with the dyed-blonde fauxhawk is still expecting Brazil to win its sixth World Cup title. Along with Lionel Messi and Cristiano Ronaldo, Neymar was among the biggest stars at the World Cup. And in Brazil, the man in the yellow No. 10 jersey is something of a megastar, with his face plastered on billboards around the country and constantly shown in TV. His play on the field lived up to the hype, with four goals in the group stage. He continued to make an impact, albeit without any more goals, in the knockout games until he took a knee in the back late in the match against Colombia. The question for Brazil now, however, is who will step up to replace Neymar as the focal point of the attack? The much-maligned Fred has been largely ineffective so far, while Hulk has also failed to score for the hosts. And making things tougher on Brazil is the suspension of captain Thiago Silva. The Paris Saint-Germain defender scored the first goal in the quarterfinal victory, but later picked up a yellow card for foolishly impeding the Colombia goalkeeper. Because it was his second yellow of the tournament, he must sit out the match against Germany. Brazil has played Germany only once at the World Cup, winning 2-0 in the 2002 final. But the Germans, who will be making their 13th appearance in the semifinals, have reached the final seven times and won three of them. At this year’s tournament, Germany coach Joachim Loew has experimented with the defense, moving captain Philipp Lahm into the midfield and then back to his usual right back position. With Lahm in the backline and Per Mertesacker on the bench in the quarterfinal win over France, the Germans looked as good as they have since routing Portugal in their group opener. “The team is improving from match to match,” said Loew, who has led Germany to the semifinals in every major tournament since taking over eight years ago. The winner of Tuesday’s match will face either Argentina or the Netherlands in next Sunday’s final. And if it’s Neymar’s teammates that prevail, the match at Maracana Stadium in Rio de Janeiro will be sadly missing the country’s favorite son.